Well, it's about that time of year when you get to see a lot of your family. Your virtual family, that is. Despite The Sims 4's many warm and fuzzy qualities, though, the game doesn't come with a ton of stuff to help put you in the mood for the holidays. Modders to the rescue! 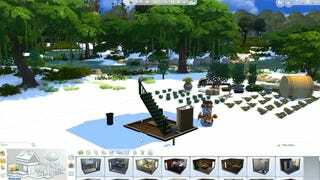 First and foremost, prolific Sims modder Zerbu has this great "snowy terrain" mod for the new installment that gives the outdoors a bit more of a wintry vibe. It's not perfect—the tops of trees stay completely green, and the rivers don't freeze over. But as Sims Community notes, it's an impressive start. Also, the trees can be adjusted on their own—more on that in a minute. You can download the snowy terrain here. 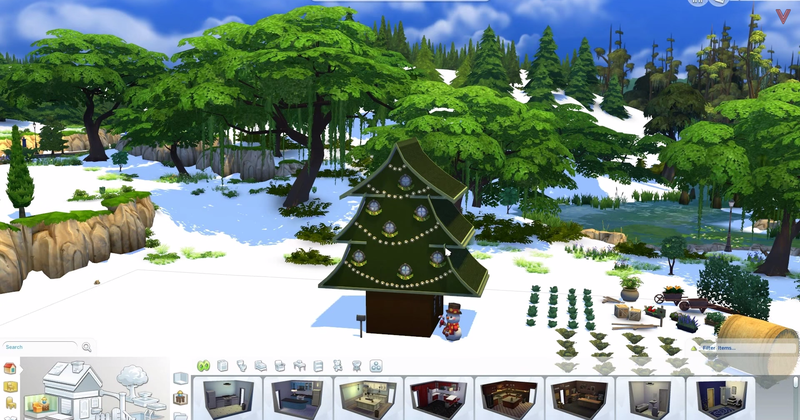 As for the trees, The Sims Resource has these special snow-encrusted ones that you can swap with the boring ol' green ones if you have the time and patience. What am I saying? This is The Sims. Of course you have the time and patience! And it's actually a full-blown house with multiple floors and everything. So cool! There's much, much, much more over at The Sims Resource—more than I could possibly wrap my head around with playing The Sims 4 for a week or two straight. Just looking under the "Christmas" tag is a good way to get started. "Holidays" works too. Ok, if I have to write "Christmas" one more time I think I'm gonna be sick. Time for more hot cocoa.